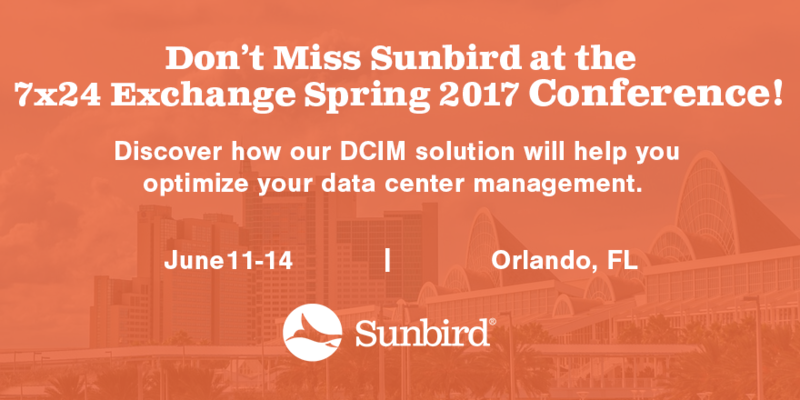 Sunbird is thrilled to be attending 7x24 Exchange Spring Conference in Orlando, Fl from July 11-14, 2017 at the Hilton Orlando Bonnet Creek. Stop by Table #31 to meet our data center experts and get a demo of our award-winning Data Center Infrastructure Management (DCIM) solution. This conference is designed for anyone involved with 7x24 infrastructures. Attendees and their organizations will have the opportunity to improve reliability with proactive plans and cooperation from diverse corporate functions. Past conferences have enabled teams of attendees to better communicate the critical importance of a proactive approach to continuous uptime. Heading to 7x24 Exchange and want to chat one-on-one with a DCIM expert? Our local Sunbird representatives will be available for individual meetings. Let us know if you’d like to meet.